This Order, which is divided into four classes, Knights of the Grand Cross, Dignitaries, Officers, and Knights, was also founded by Don Pedro I. on the 1st December, 1822, instituting the reigning Emperor as Grand Master. The decoration (No. 4) is a pentagonal white enamelled Cross, resting upon a green laurel wreath with broad edges mounted in gold, and the ten points of which bear little gold balls. The gold scutcheon in the centre of the obverse, shows the effigy of the Emperor Don Pedro in relief, and is surrounded by a dark blue ring with gold edges, and the legend "Petrus I. Brazilise Imperator" (Pedro I. Emperor of Brazil). 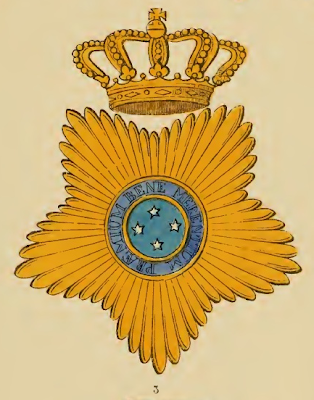 The four stars which form this curious constellation of the South Cross, are exhibited upon the sky blue centre of the reverse, which is also surrounded by a dark blue ring with gold edges, and the legend, "Prsemium bene Merentium" (Reward of the well deserving). This Cross is surmounted by a gold imperial crown, and is worn by a sky blue ribbon (more or less broad according to the degree of the wearer) by the Knights of the Grand Cross across the right shoulder, by the Dignitaries round the neck, and by the Officers and Knights upon the left breast. A pentagonal radiating star of gold below an imperial golden crown, the middle face of which contains the same as the reverse of the Cross, distinguishes the owners of the three higher classes, and is worn by them upon the left breast (No. 3). The particular characteristic of the Order is, that Princesses, Duchesses, and other high born ladies, are not excluded from it.